While doing seminars and product demos at trade shows and tackle retailers, I often hear from consumers that they wish this rod or that rod was this length or action. Sometimes it's about color, etc.What I tell them is to contact a custom rod builder. Most of the time you can have the rod of your dreams built without breaking the bank. I use one such company called Dixie Custom Rods located near my home in Tennessee. Dwayne "Big D" Wilson, who is known as a serious local pro bass angler has been building rods for nearly 15 years. What makes him and others like him good at what they do is they listen to all anglers about what makes a great rod. By conducting a lot of research and development, they get rods into the hands of those who seek them out. They make what other anglers only wish they had. Like most true custom shops Dixie Custom Rods is a one-man shop. “Big D” makes up to 1,000 rods a year and 99 percent of them are true custom models from length, action, handle, color and name/logo. One way to know who builds great custom rods is to go to local trade shows and tackle shops. See who is using what brand of custom rods. Google the company name a read rod reviews. 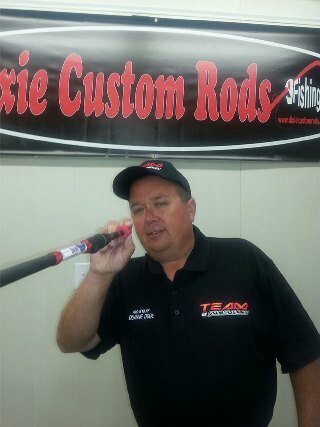 I have several rods and some are custom made by Dixie Custom Rods. I can tell you that his rods are top notch and would recommend him to anyone in need of a custom fishing rod.